When Moctezuma, the Aztec Emperor met Conquistador Hernan Cortez in 1519, he thought the Spaniard was the god Quetzalcoatl returned to fulfill a prophecy ending the empire. Though he had just a few soldiers with him, Cortez was able to use superior armor and guns to outsmart the Aztec king and defeat his army. After all, how could the Aztec soldiers compete with these strange men/horses whom they believed to be a new creature with two arms and four legs. After Cortes destroyed the Aztec capital of Tenochtitlan, the Spanish claimed Mexico as part of their empire. Almost none of that story, turns out to be true. 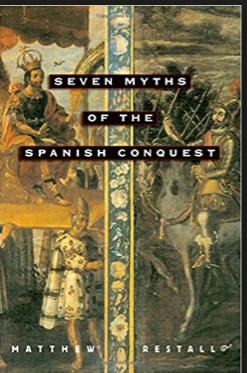 According to Matthew Restall’s convincing book, Seven Myths of the Spanish Conquest. Mr. Restall presents a convincing case against the notion that the Aztecs thought the Spanish were gods. This legend is the result of misunderstanding the way different cultures talk to kings. Moctezuma recognized Cortes as a great leader and spoke to him the way all Aztecs spoke to important people, calling them “godly,” “sent by heaven,” “like a god” they way you do when you’re an Aztec talking to someone important. This, it turns out, is one of those stories that get started long after the event. Neither Cortes in his letters to King Charles, nor Bernal Diaz in his first hand account of the conquest claim they were seen as gods, but they do record events in a way that allowed subsequent historians to create this legend. Cortes had thousands of solders with him. However, most of them were other native people. He arrived at a time of conflict between tribes making it possible for him to join forces with the Aztec’s rivals in the Valley of Mexico. He was also accompanied by many free blacks and African slaves, men who had been promised freedom should things go well and should the return a certain percentage of their new-found wealth to their owners. His own men weren’t even soldiers. The Spanish who went to the Americas in the 16th century were basically entrepreneurs. They were working without pay in the hopes that, should they be successful, they would be granted a encomienda, An encomienda was basically a group of native people whose labor you were allowed to tax. Not slaves exactly, nor a land grant like a fief. As I understand it it’s like being able to tax the people in a particular town without owning either the town or the people. It could be a means to acquire great wealth as one might end up governor of Mexico itself. The Spaniards with Cortez were experienced at warfare but they were not soldiers. There were no professional soldiers in Europe at that point in history. All men, more or less, took part in warfare when required but there was no professional paid military yet. Instead, Cortes went to the Valley of Mexico with artisans and shop keepers. Village blacksmiths who somehow managed to get enough money together to pay for the trip to Cuba where Cortes recruited them for his expedition. They may have had some armor but it’s very hot in Mexico, so it’s not likely that they wore it much. And as for using guns, 16th century guns had to be reloaded after every shot and only worked if you managed to keep your powder dry. Once you were out of powder, you had to wait for more to arrive from Spain. That said, their steel swords were a tremendous advantage over the Aztecs, the Incas and all the rest. While the native people had no horses before the Europeans arrived, nor pigs or dogs by the way, they were not frightened of them. They saw them as a sort of deer, which they had seen, and probably never thought the men who rode them were physically connected to them. Really, if you think about that one for a minute you can see just how improbable that was. In fact, in no time at all the native people had horses of their own. As for the Spanish ruling the new world after Tenochtitlan fell to Cortes, not so fast. The Aztecs, the Maya, the Incas, all their rivals, existed as politically independent groups long after what we call the period of conquest ended. Some lasted until the very end of the 19th century. While Seven Myths of the Spanish Conquest is written to be used as a college level text, my copy came with a Duke University sticker, it’s a very readable book, easily accessed by readers who are not graduate students. Okay, maybe not easily for many readers. But if you’re something of a history nerd, like I am, with an interest in the period, I suspect you’ll enjoy this book as much as I did. I’ve already place Mr. Restall’s new book, When Cortes Met Moctezuma on order at my local book shop. I love this kind of stuff. And I hated history in school. We’re definitely teaching it wrong when there are so many fascinating stories like this but nearly everyone dislikes the way it’s done in schools and most history professors tell their students to forget what they learned in high school.